Markets will be volatile next week and it would make sense to enter into limited calls and book profits quickly. 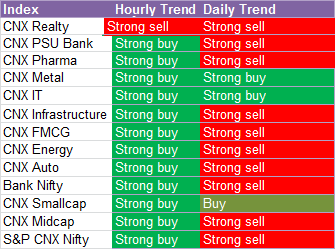 Most of the sectors have turned buy in the hourly charts. IT and Metals have given buy signals in daily charts as well. For today, we will be long in Metals and IT and short in reality. Banking is still neutral and can go either way - up or down for next few days. Nifty (5471) will face resistance at 5500-10 followed by 5540-50. Nifty will be positive above 5510 and very bullish if 5550 is sustained. Avoid intraday longs below 5450. Supports will be 5450 and 5410. Tata Steel - Buy above 284.5 for a target of 287-88 with SL at 280. For positional traders a move above 288 will give 293-300 in next few days, keep SL for positional longs at 260. TCS - Buy above 1840 for a target of 1850 with SL at 1825. Sustaining above 1850 could give 1860-70 with an SL at 1840. Tata Motors - Seems to go upto 310-320 in the short term. For intraday, buy above 305 with SL at 299 for a target of 308-310. BHEL - Buy above 118 for a quick profits of 1-2 points. Keep target of 120 with SL at 114. HCL Tech - Buy above 955 for a target of 960 with SL at 945. ONGC - Buy above 280 for a target of 283-286 with SL at 276. L&T - Buy above 743 for a target of 748-50 with SL at 734. SBI - Sell below 1538 for a target of 1520-10 with SL at 1567. Cipla - Sell on rise to 398 with SL at 405 for a target of 394. Fresh sell below 391 for a target of 388-86. Ranbaxy - Sell below 384 for a target of 380 with SL at 391. Bharti Airtel - Sell below 303 for a target of 299 with SL at 309.